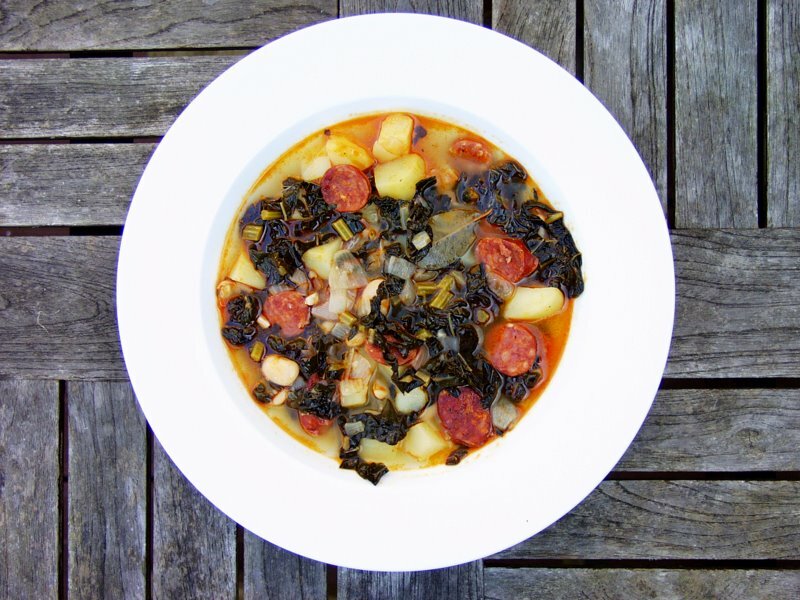 Caldo verde is otherwise known as Portuguese green soup, or broth, and whilst you can simply cook it as a soup, I tend to make more of a meal out of it and give it centre stage. Its perfect for autumn or winter as it is satisfyingly hearty and filling. I deviate slightly from the traditional recipe of onion, garlic, cavolo nero/kale and potatoes by also adding 240g (basically one tin) of butter beans and spicy chorizo. It’s satistfyingly easy to make and guaranteed to be a crowd pleaser. If you are passionate, as I am, about stews and soups then this one will really appeal to you. I particularly like to add spicy chorizo to give it that extra kick, but if you cannot find the spicy variety you can simply use normal chorizo and add a sprinkling of paprika on the top before serving. 1. Place the olive oil in a deep pan – I use my Le Creuset casserole pot – and when it is hot add the chopped onion, on a low heat for 5 minutes. Then add the chopped garlic and stir into the onions. 2. When the onions have become translucent add the spicy chorizo, which will begin to create a lovely red hue to the onions as the spicy chorizo begins to mix with the onions. Stir for a couple of minutes. 3. Add the diced potato, butter beans (tinned variety) and bay leaves and thoroughly mix into the onion, garlic and chorizo. Add 1 pint of chicken stock and let the soup simmer for approximately 10-15 minutes, by which time the potatoes should be soft. 4. Add the finely chopped greens. I use cavolo nero, which is black kale, but any type of greens works equally well. You may find you need to add some more stock at this stage, depending on how soupy you like your soup. 5. Season with pepper and salt to taste. Serve piping hot with crusty bread on the side. 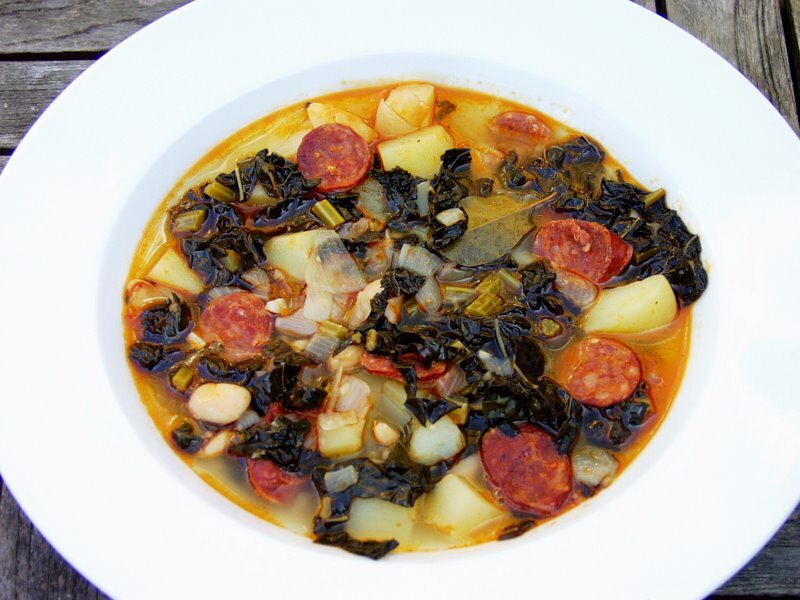 This entry was posted in Pork, Soup, Stew and tagged broth, caldo verde, cavolo nero, chorizo, greens, hearty food, kale, portuguese, soup, stew. Bookmark the permalink. This was amazing! We’ve never tried anything like this before. Bursting with flavour. Warm, healthy, tasty. Ticked every box! A must try! Thanks for the feedback Emilia. It’s always lovely to hear from people who have cooked the recipes. Am glad that it was a hit.